Fancy an authentic Italian shave? If the answer is yes then the new Acqua di Parma Barbiere is a must visit. 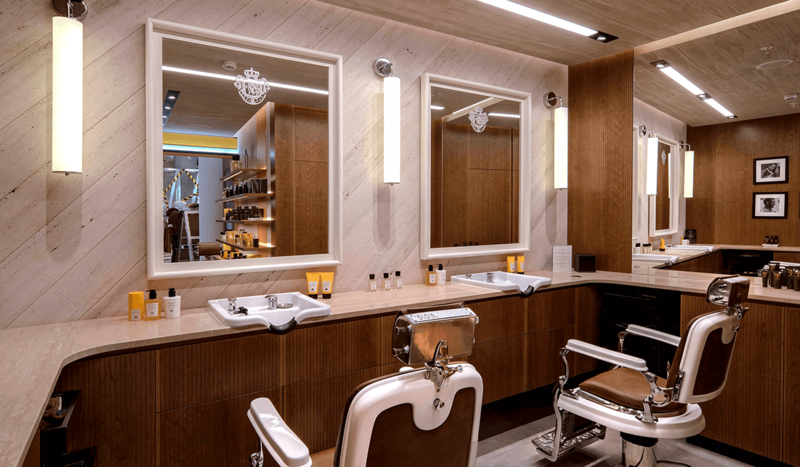 Housed in the ultra-contemporary setting of the new Men’s Designer Street Fashion Floor in Selfridges, London, after a spot of shopping this is the place to go for a bit of relaxation and all your male grooming needs. The first standalone location in the UK, Acqua di Parma are now able to offer their most popular boutique service in London with treatments including the Traditional Italian Shave, Prestige Shave, Eyebrow Shaping and for those looking for an even more relaxed and fresh look you can try the revitalising treatment for the face and eyes. There truly is something for everyone, and in particular – the sophisticated London gentleman. This stylish and luxurious setting, with dark wood, leather and bursts of the radiant Acqua di Parma yellow, is designed to enhance the shaving ritual wit light arranged specifically to achieve an impeccable shave by the skilled hands of an Acqua di Parma Barber. After experiencing this unique and authentic ritual you can also discover and shop the brand’s entire olfactory universe, giving you the chance to relive the experience once back at home. A new place where us gentleman, or any Ape (looking to be more gentleman) for that matter, can indulge in such a private and personal routine – Ape Approved. For bookings please contact the Acqua di Parma Barbiere Selfridges on +44(0)207 318 3595.